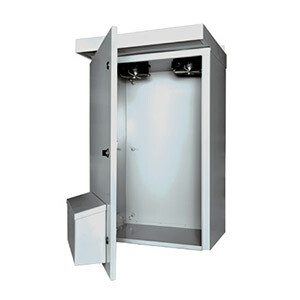 The SCE-3RV outdoor enclosure series is designed to house electrical controls, drives, instruments and components which require weatherproof protection and cooling. These electrical enclosures have built-in venting and one or two 115 Vac fans to provide cooling. These outdoor enclosures meet IS7 Industry Standards to provide a degree of protection for the equipment inside the enclosure against ingress of solid foreign objects (falling dirt); and provide a degree of protection with respect to the harmful effects on the equipment due to the ingress of water (rain, sleet, snow). Finish: White powder coating inside and out; optional panels are powder coated white. Weatherproof Ventilated Outdoor Electrical Enclosure with Fan, 29 H x 24 W x 12"D"
Weatherproof Ventilated Outdoor Electrical Enclosure with Fan, 35 H x 24 W x 12"D"
Weatherproof Ventilated Outdoor Electrical Enclosure with Fan, 41 H x 24 W x 12"D"
Weatherproof Ventilated Outdoor Electrical Enclosure with Fan, 47 H x 24 W x 14"D"
Weatherproof Ventilated Outdoor Electrical Enclosure with Fan, 53 H x 36 W x 16"D"
Weatherproof Ventilated Outdoor Electrical Enclosure with Fan, 65 H x 36 W x 16"D"